Home » Coastal Blog » Coastal Or Tropical? Find Your Beautiful Style! Coastal Or Tropical? Find Your Beautiful Style! 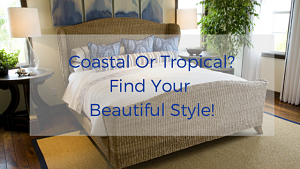 When you think of either the coastal or tropical style you most likely already know which design you already love and have been aquainted with for a long time! Maybe you aren't quite sure how to bring that style into your home. We have all been on vacation and come home thinking, I want that look, but just need a little help getting it accomplished. Let's take a look at both styles. Colors for the Coastal Style fall into the color palette of soft or pale blues, whites and creams. Fabrics are generally light weight. Think cool fabrics against the skin, linens, cottons, and sheers for the windows. Beach Houses almost always never lack an abundance of natural light, but don't be discouraged, artificial lighting can be used to set the beach house mood in any room. The intensity of artificial light can create texture, movement and pattern in the room design. Coastal Accessories can be as simple as shells from your trip to the beach or your favorite coastal decor placed on your favorite end or side tables, coffee table and nightstand. Colors for the Tropical Style are all about the brightest and loudest colors brought to the designed room. Think, melons, bright pinks, greens and blues. Fabrics are all about the prints. Tropical palms and tropical design patterns. Keep these to a minimum. Don't oversatuated the room with color or your favorite design. Tropical Homes tend to have darker furniture and textures in natural woods of bamboo, rattan and wicker. 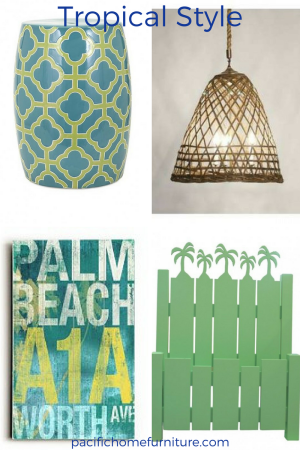 Accessories for a tropical styled home can incorporate plants, palm pillows and surf boards. Lighting usually will focus on a natural fabric on the lamp and ceiling fans with an island vibe. 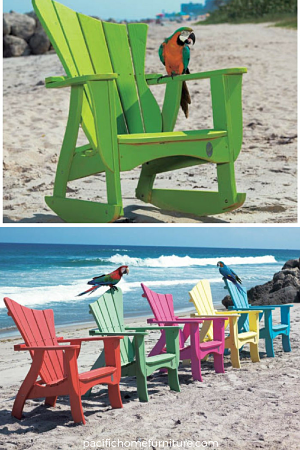 These wave chairs with their bright and bold colors will look fabulous on the beach or your patio! Have you found your beautiful style? Coastal or Tropical? 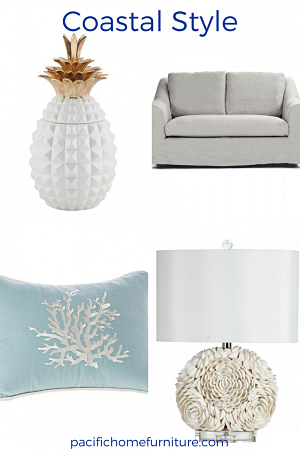 We would love to hear from you and how you decorate your beach home! 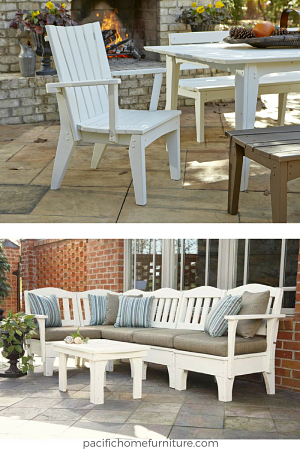 Please reach out to us with your questions or thoughts on this blog or at contactus@pacifichomefurniture.com. See what we have been doing on Pinterest. We would love to have you join us!